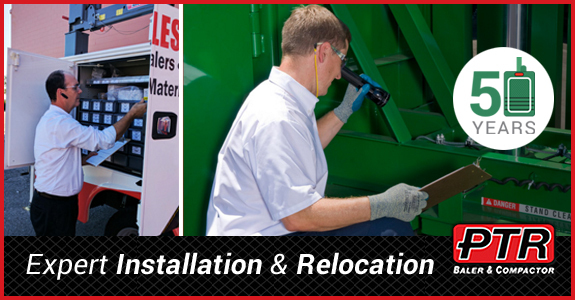 PTR Baler & Compactor offers equipment installation, modification and relocation services. Services are done promptly by our expert technicians to ensure proper functioning. This is key in the productivity and longevity of your waste equipment. If your equipment isn’t measuring up, contact PTR for an appointment today. We’ll promptly send our technicians out to evaluate the product. We specialize in offering custom solutions to maximize efficiency and optimal equipment performance. What makes a ‘PTR Installation’? PTR will schedule your baler, compactor or other waste equipment installation to fit your individual needs. On a tight time line for a grand opening, or need a system replace quickly? We’ll go above and beyond to get your installation completed. We also offer relocation services. Our team is capable of moving your waste equipment from coast to coast. You handle the day to day operations of your business, and PTR will coordinate freight, equipment installation and propose the best custom solutions. If you need a modification or relocation, or have difficulty loading or operating your current equipment, contact PTR today. We’ll schedule an evaluate and offer an expertly crafted solution. Learn more at ptrco.com.